Look out NYC! Its Mike Saint-Jules birthday and the night is going to be nothing short of fantastic! With an ultra hot line up and a great Bar, this night is sure to be talked about for some time to come! August 15th doors to Bar 13 in NYC open at 10pm and that precisely when everything is going to start to get crazy! With DJ Alex Pearce and DJ Hunter, Mike Saint- Jules plans on taking the reigns….and decks and including us all in his birthday celebration- NYC style! Make sure to email for reduced admission to this event that is sure to pack the club quickly! Cover $15 @ the door $10 on reduced list Email for reduced! 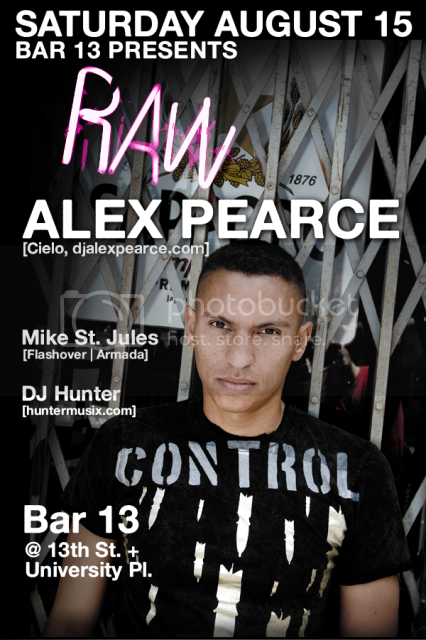 Brandishing his signature driven style of electro and tech house Alex Pearce’s live performances take aspiring audiences through a musical journey. Alex’s sets boast a unified sound aimed at challenging the audience’s senses, and giving them an undeniable urge to dance. With an arsenal of prime mixing, programming and selection ability, Alex has earned the right to rock crowds across the East Coast and South America. During this exciting and progressing voyage Alex has also been honored to work alongside talented artist such as Sander Kleinenberg, Seb Fontaine and Behrouz. Pearce’s cumulative results have garnered exceptional residencies; headlining nights at internationally recognized venues Cielo and Webster Hall in his hometown of NYC. Just as active within the production scene, Alex released “Carbon,” on Spice Cadet Recordings in March and “Purpose,” a collaboration with Tony Mugavero on Freq1see Records in July. Now with his (w/partner DJ Ebar) Quarterlife Records imprint, Alex has an outlet for extending his lusty NYC house sound across the globe. Quarterlife Records experienced rapid action in ‘08 with Alex remixing an original of John Digweed protégé, Royal Sapien’s original “Everything I Love is Underground”; Alex’s own original release, “Dat Sound” was released on the label in mid September. Topped off with successful label and release events that have delightfully surpassed expectations. Looking ahead Alex looks to build on his current success by advancing his production and event portfolio even further. It’s going to be an exciting time for everyone involved. 13 is well known among locals and visitors alike as a lounge, a club and an oasis from your everyday. Sit down among the rooftop palms or lay low in the James Bond style martini lounge. Sip a bit before you shake your troubles away on one of our two dance floors. Internationally known DJs spin techno and house for an intimate dance experience all but disappeared from downtown. Just off the historic Union Square, turn the corner and weekly parties, drink specials and hip hop classics beckon. Home to legendary parties and legendary drinks Bar 13 has been featured in many magazines and guides. 4 more days!!!!!!!!!!! I cant wait its been so long since ive been in the city to party!!! and the list is looking really nice! wowowow, im excited for this great night..and OUTDOOR area- sweet! Mike has made us all a special mix to get us ready for the night! !